Wyndham SeaWatch Plantation is so large it’s practically four timeshare resorts in one. 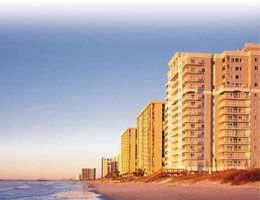 Located between North Myrtle Beach and Myrtle Beach, South Carolina, the expansive property includes a combination of timeshare villa-style complexes and high-rise towers. With so much fun and on-site activity, you could easily love your whole vacation without ever venturing off the resort property. Located on SeaWatch Drive, the name says it all: this is your Wyndham plantation-sized resort designed for taking in everything related to seaside sports and activities. Wyndham SeaWatch Plantation Villas start with 600-705 square foot, 1-bedroom deluxe villas designed to sleep four vacationers and include 2-bedroom deluxe villas (912-1002 square feet) that sleep eight, and 3-bedroom deluxe villas (1056-1295 square feet) that sleep up to ten. Wyndham SeaWatch Plantation Towers include a diversity of condo sizes and layouts; ranging from 1-bedroom deluxe units to 2-, and 3-bedroom units as well as both 3- and 4- bedroom presidential condos. The 1-bedroom deluxe units range from 653 to 811 square feet in size and sleep up to four comfortably. The 2-bedroom deluxe units range in size from 927 to 1088 square feet and sleep up to eight comfortably. Depending upon their floor plans, 3-bedroom deluxe units sleep either 8 or 10 vacationers and range from 927 to 1088 square feet in size. The Wyndham SeaWatch Plantation Towers presidential units are the most spacious timeshares at the resort with 3-bedroom presidential condos at 1786 square feet, accommodating 10 happy vacationers while 4-bedroom presidential condos are 1889 square feet in size and accommodate up to 12. All of the properties in this tower include full kitchens, dining areas, in-unit washers and dryers, and a deck or patio. The 1-bedroom deluxe condos include one private bath, while all of the 2- and 3-bedroom deluxe and the 3-bedroom presidential condos include two private bathrooms, and the 4-bedroom presidential units have 3 private bathrooms. 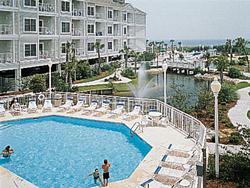 Wyndham SeaWatch Plantation North Tower offers both 1- and 2-bedroom deluxe timeshare condos. The 1-bedroom condos are designed to sleep up to four adults and range in size from 581 to 603 square feet. With full kitchens, dining areas, an in-unit washer and dryer, and a balcony or deck, these condos vary in size from 581 to 603 square feet. 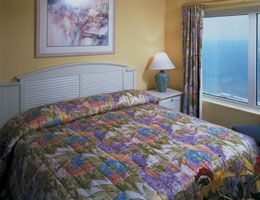 At Wyndham SeaWatch Plantation North Tower, 2-bedroom units are designed either to sleep up to eight adults or up to six, depending upon the floor plan you select, and vary in size from 987 to 1232 square feet. These condos include all the features also found in the North Tower’s 1-bedroom condos with the addition of 1 extra bathroom (2 baths total) per 2-bedroom unit. So Much to Do, Where Do You Start at Your Wyndham SeaWatch Plantation Timeshare? 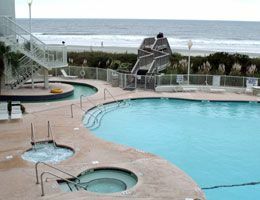 With five outdoor swimming pools, an indoor children’s pool, two heated indoor swimming pools (seasonal for winter with enclosed glass that is removed during summer months) two lazy river floats, and two indoor and nine outdoor hot tubs, the Wyndham SeaWatch Plantation is designed for those who want to splash it up or perhaps just kick back by a different pool every day. By total count, this timeshare resort actually offers 22 bodies of water for swimming, soaking, splashing, or drifting along. 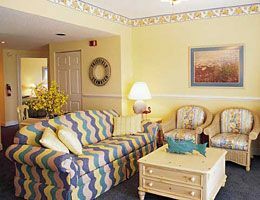 And of course, when you vacation at this spectacular Wyndham resort, you’re just a boardwalk stroll away from a beautiful strip of Atlantic Ocean, golden sand beach, ideal for surfing, fishing, boating, and a range of water sports. Abuzz with organized activities, you can take your pick from jewelry making, arts and crafts, turtle races, games, and entertainment. Camp Sparky Kids Club is designed for children ages 6 to 12, while activities that are more ‘sophisticated’ keep teenage vacationers engaged. Adult day trips include vineyard tours, shopping trips, and excursions to art galleries and other local points of interest. Other onsite amenities include a restaurant, exercise equipment, and game room. Some activities require an additional fee and the cost to use the exercise facility is $5.00 per person, per day. The property is located along the area’s restaurant row, with many choices for dining within a two-mile area. Groceries and discount stores are within one mile of the resort. This Wyndham managed property offers special needs accessible units, elevators, and is Wyndham Green Certified. RCI Gold Crown award-winning resort. VIP Benefits Apply; property includes inventory in CLUB WYNDHAM Access. 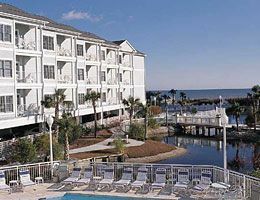 The best deals on Wyndham SeaWatch Plantation Club are available as timeshare resales through BuyaTimeshare.com. Contact Wyndham Seawatch Plantation Specialist Today!